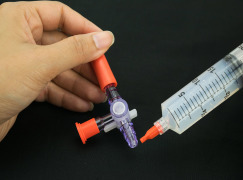 Master Bond Inc. is a leader in the design, formulation and manufacture of epoxy adhesives, sealants, coatings and potting/encapsulation compounds for the assembly of both disposable and reusable medical devices. 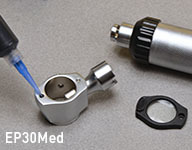 These uniquely designed products offer designers and manufacturers of medical products the level of reliability and performance essential for the many different operating conditions encountered in use. These include special formulations that are biocompatible and are resistant to various types of sterilization. 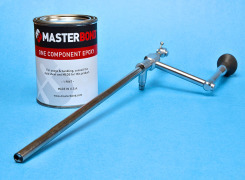 Master Bond’s product line includes epoxies, urethanes, silicones, cyanoacylates, and specialty solvent based systems. These user friendly products can be cured at ambient and/or elevated temperatures or upon exposure to UV light. 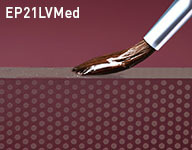 Specific formulations fully meet the USP Class VI protocol. Master Bond’s technical staff welcomes the opportunity to provide assistance to medical device manufacturers in the solution of specific assembly problems. 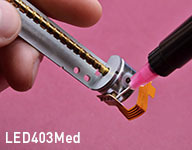 Master Bond adhesives, sealants, coatings and potting/encapsulation compounds can simplify and enhance the performance of many critical medical devices. Formulations have been developed which offer high physical strength properties and outstanding chemical resistance even when applied on dissimilar or difficult to bond materials. Additionally, selected products retain their desirable performance upon exposure to various sterilization procedures including autoclaving, radiation, ethylene oxide and the recently developed cold sterilants. Specifically developed technologies for treating a variety of substrates are commercially available to assure optimal performance even upon exposure to severe environmental conditions, as well as contact with a wide variety of fluids and occasional abuse. 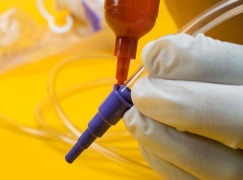 Learn more about some of our most popular medical adhesives, sealants and coatings. At Master Bond, we are proud of being at the forefront of developing new and innovative products in the medical device industry. 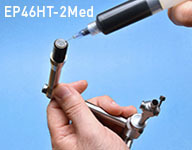 Of particular interest is EP42HT-2ND2, a high viscosity, non-drip medical grade adhesive that complies with the testing requirements of USP Class VI plastics and is capable of withstanding repeated sterilizations including radiation, chemicals and steam. Also noteworthy is EP3HTSMed, a one component, fast curing, silver filled electrically conductive epoxy system featuring high shear strength and good temperature resistance. MasterSil151Med is a two component low viscosity silicone compound for high performance casting, potting and encapsulation. 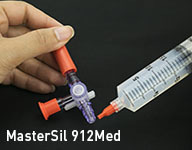 Newly developed MasterSil 153Med is a two component, addition cured system that does not require exposure to air for complete cross-linking and will not outgas while curing. 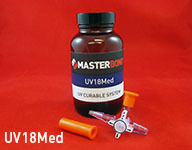 And UV18Med is a one component, high strength, flexible UV curable resin compound with outstanding chemical and water resistance. 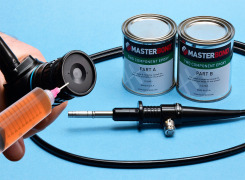 Master Bond's complete line of UV curable polymers includes epoxies and urethanes, which can be used as adhesives, coatings, sealants, encapsulants, and potting compounds. Specific grades are formulated to be optically clear, non-yellowing, flexible, and high strength. UV curable adhesives cure extremely quickly, and upon exposure to a commercially available ultraviolet light source, cures can be achieved within a couple of seconds. These compounds cure at ambient temperatures and require no mixing. Each UV adhesive and coating product varies in viscosity, hardness, chemical resistance, thermal stability, electrical insulation and optical properties. 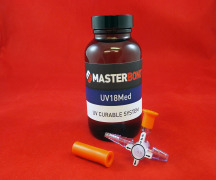 For the UV curable adhesives, sealants and coatings, Master Bond offers a “double light barrier” packaging system where the UV compound is packaged in a light blocking black applicator and the syringe itself is sealed in a black plastic pouch until ready for use. All packaging processes occur in a totally light free environment, thereby greatly lengthening shelf life at ambient temperatures and preventing premature contamination of the compounds. 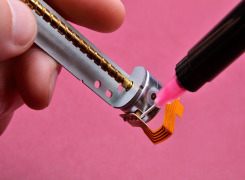 Master Bond provides one on one personal technical support and will recommend the product that will optimally match the specific design requirements of any medical device. Adhesives, sealants and coatings with outstanding sterilization resistance are provided to fulfill the most demanding needs of medical device manufacturing. Grades that resist steam autoclave, ethylene oxide (EtO), radiation and cold chemical sterilants are available. These compounds retain their performance properties even upon exposure to multiple sterilization cycles and are effective for reusable medical devices. Examples of these performance properties include, but are not limited to, high bond strength, electrical insulation, flexibility, optical clarity, high/low temperature resistance, and more. Master Bond offers a wide selection of packaging solutions to best meet your specific application requirements. They are designed to maximize productivity, reduce waste and maintain consistently high product reliability. Packaging options are available for one and two component epoxies, polyurethanes, polysulfides, silicones, acrylics and UV cure systems. Additionally, special packaging is available for cyanoacrylates, latex systems and other resin formulations. For more information contact Master Bond Inc.